Books > Knitting, Crotchet, Sewing etc. 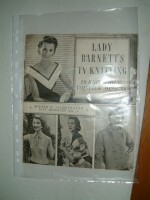 Lady Barnett`s TV Knitting a knitting pattern booklet free with Woman`s Illustrated (gift booklet No. 1) in good condition. 20 knit why you view designs. I have no idea of the date but Lady Isobel Barnet looks very young.